We have some sad news: Hitting the snooze button is not good for you. In fact, being dependent on your alarm clock’s snooze function just leads to that morning crankiness, grogginess and sluggishness that none of us enjoy; and that feeling of tiredness and lack of energy can even stay with you throughout the day. We know how you feel. We loved hitting the snooze button, too; and this information absolutely threw us for a loop. We really didn’t want this sleep myth to be debunked, but as we looked into it more and more there was just too much evidence. So, we stopped using the snooze button—let it not be said that we don’t practice what we preach—and though it hasn’t all been smooth sailing, we can confirm that it does get better. 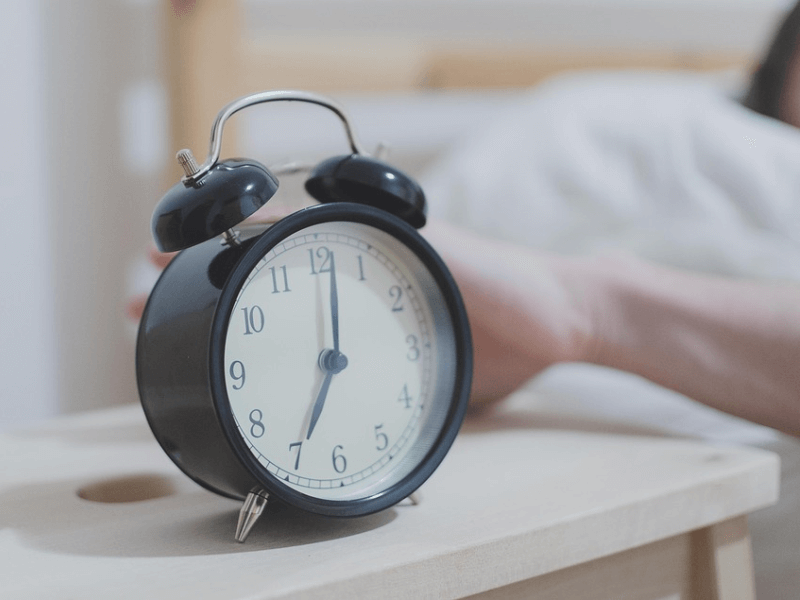 But before we get into how we weaned ourselves off the snooze button, let’s look at the facts and answer some burning questions that you’re probably dying to have answered. Why is the snooze button a bad idea? And if it’s so bad, why does it feel so good? Why was it even introduced an an option, in the first place, if it wasn’t something that would help us? All excellent questions. Now, let’s answer the last one first. Why Do Alarms Have a Snooze Button? The truth is, no one knows exactly how the snooze button came into existence. There is no concrete information about the actual invention and subsequent addition of the snooze button to alarm clocks. We don’t know why it was invented, and who invented it; but what we do know is when it started becoming a widespread phenomenon. In 1956, the Telechron 7H241 was introduced to the public by the General Electric Company. Marketed as the most humane alarm clock the world had ever seen so far, the product was the first of its kind with a snooze button. Later model 7HA241 improved upon the original design by adding a luminous dial on the clock face. 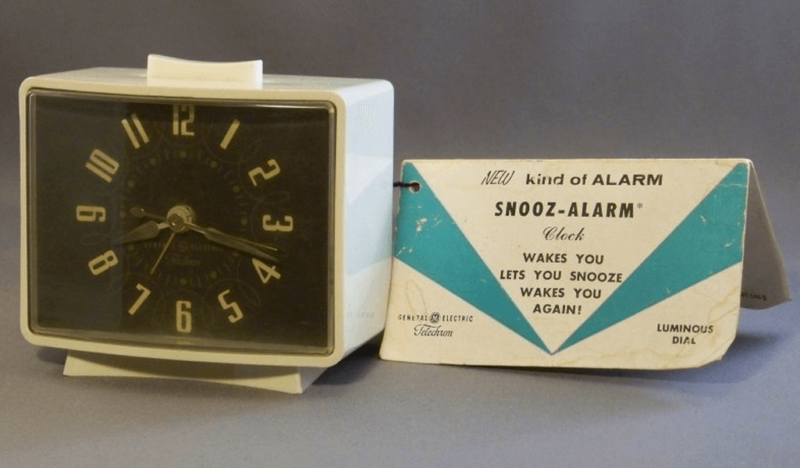 Over six decades later and countless leaps in technology after, the idea of the snooze function persists; even though physical alarm clocks have all but gone the way of the dinosaur in this smartphone era. The snooze button was probably heralded as a humane addition to the good old alarm clock because it seemed logical at the time. The idea of being able to turn off your alarm, without the risk of completely disregarding your normal wake up time and missing appointments or other responsibilities, must have seemed like a modern luxury in the 1950s. It wasn’t unreasonable to assume that it was a perfectly healthy practice, either; after all, it allowed people to sleep just a little bit longer. Also: It feels really good, at least when you’re actually snoozing. One can even argue that the snooze button can be addicting. With a normal sleep-wake routine, it can sometimes feel like your schedule is the boss of you; but the snooze button lets you be the boss—for about ten minutes at a time, until you finally roll out of bed and get ready for work. So you hit snooze once or twice. What happens after? Why do you sometimes feel tired and drained throughout the day, even with a few more precious minutes of sleep added to your routine? Here is where it gets interesting. We’re just making suppositions here, but you’re probably doing two things consistently: setting your alarm a little earlier than the time you really need to get up, and pressing snooze more than once. Why Is Using the Snooze Button Bad for Sleep Health? When you set your alarm earlier, it’s very likely that you are shaving off time from restorative sleep—the ideal seven- to eight-hour slumber you’re supposed to be getting every night. If your bed seems impossibly cozy and comfortable, it’s because your body doesn’t want you to get up. Basically, it’s telling you that you need more sleep in order to be fully functional. If you’re sleeping six of less hours regularly, that’s chronic sleep deprivation, or “social jetlag”. 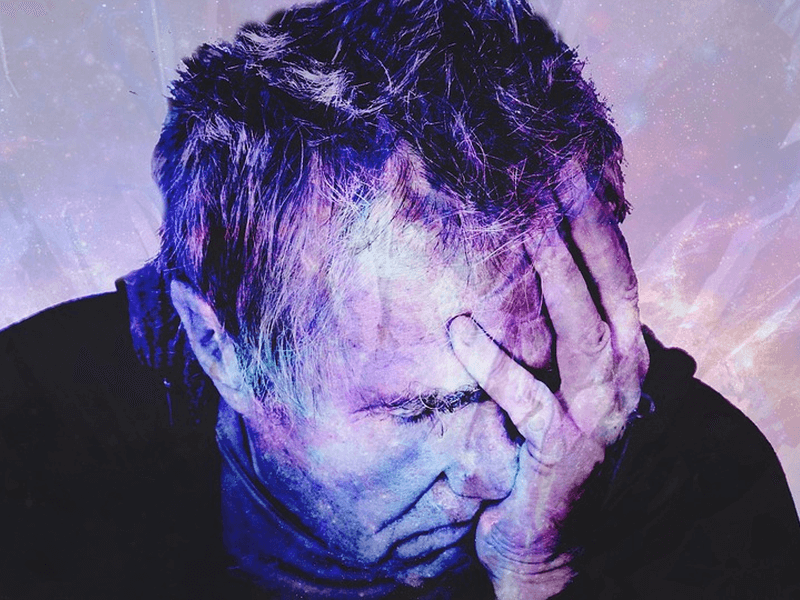 Many studies show that sleep deprivation—and the lack of energy and alertness associated with it—affects attention, behavior, decision-making capabilities, and even physical health. What’s worse is that when you wake up in the middle of a sleep-wake cycle—as you’re bound to do if you set your alarm earlier—you’re more likely to suffer from sleep inertia, which has been studied and shown to be potentially more debilitating than being sleep deprived or legally drunk. That familiar but unwelcome feeling of grogginess and disorientation that comes with waking up too early is sleep inertia at work. When you get enough sleep, your body knows it; and it prepares itself even before you open your eyes. This brings us to the second point. When you wake up to your alarm, it signals the end of uninterrupted sleep. Even if you drift off and get a little bit of extra shuteye after every snooze alarm, you’ll only be getting fragmented sleep; which is far less restorative than consolidated sleep. This further disrupts your sleep-wake cycle. Even a custom fifteen-minute snooze interval is not enough time for your body complete a full run from NREM (non-REM) to REM (rapid eye movement); you would need at least an hour and a half. This means that each time you wake up to a snooze interval, you are forcing yourself to wake up against your body’s better judgement—each time you doze off, your body naturally gears up for another full sleep cycle—and further fragmenting your sleep and worsening your sleep inertia. This consistent disregard for what your body knows it should be doing can throw off your circadian rhythm entirely, and can severely impair your ability to stick to a sleep-wake cycle. Why don’t you feel sleepy at night? Why do you feel tired all day? Here’s your answer. The snooze button is addictive. Each time you press it, you are confusing your brain. This is because you choose to do one out of a number of conflicting things when you hear an alarm and hit snooze: You go back to sleep, or lie there for a few minutes before getting up, or even get up immediately. Long term snooze button users may find that they no longer wake up for the initial alarm; and so they resort to depending on multiple snoozes or even multiple alarms. This is the opposite of training and conditioning yourself to be efficient. What happens is that the sound of the alarm itself becomes less effective over time, because you choose to disregard its original purpose. As such, you become even more addicted to the old snooze button. Now, ask yourself: On average, how many times do you hit your snooze button? How Do You Stop Using the Snooze Button? Like most addictions, the snooze button is simply a symptom of a much bigger problem. Unlike most addictions, though, the bigger problem is easier to spot—because it can only be one thing. You’re not getting enough sleep! It seems like such a simple reason, but all the research we’ve done points back to this. In the end, good sleep hygiene and getting a good night’s rest regularly should make the snooze button obsolete. It’s as easy as sleeping a little bit earlier; if, for example, your snooze intervals are about 10 minutes and you hit snooze about three times, sleep 30 minutes before your usual bedtime. As long as you get seven to eight hours of sleep, you should be able to feel the difference. We felt it! After a few days of not using the snooze button and sleeping earlier, you’ll find that you may even wake up a little bit before your alarm goes off. Give it a try; but maybe start on a weekend, so you don’t risk being late for work. Trust us, your body will thank you for it.